I'm still on the hunt for the Wild Rose or French General Moda fabrics. Not the easiest to find. Yesterday I found a piece "Double Chocolate by 3 Sisters for Moda, it mixes well, has a touch of blue and has a great cream background. Well, during my hunt this week for black & white fabrics, I bought other fabrics. Received my book, Love the Primitive look. I really don't have darks, so of course, had to shop. Found some great fabrics at SewFlakes in Broken Arrow and The Log Cabin in Bixby, OK. I also finished the Yellow top, it's ready to quilt, hopfully I will get it sandwiched today and start quilting it. Hunting fabric for this great book. 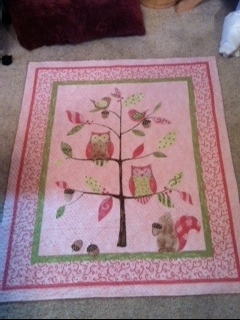 I found the background yesterday at SewFlakes in Broken Arrow, OK. Yummy, now the hunt is on for the flowers and stems. 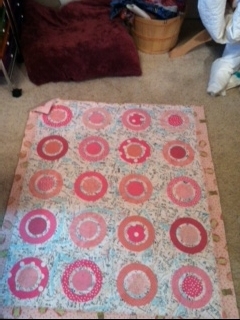 It's a pattern I purchased from Scrappy Applewood....you might check her blog out... lots of nice patterns there. Can you find the Lady Bug on the back? The backing is what I call "my Modern Quilt"
Can you find the Bird on the Front?This was an interesting quilt to make for sure! Finished "Hey Birdie, Hey Birdie Where Art Thou"
Well, I got so tired of hunting fabric.....since I moved ..... Saturday morning I tore into my closet in my sewing room. I knew I had loads of room, but everything was spilling over. First, worked on the closet, then tore into the fabric shelves. I put all my books in the closet, that have me loads of room on the shelves in the room. I went thru all the fabrics, straightened and folded and placed neatly on the shelves. I had already turned the sewing cabinet around so that the light would come in from behind hoping to help the glare. Here are the results. I am very pleased. And actually I have MORE ROOM FOR NEW FABRICS, whee, that's nice for sure. I definitely need more black on black fabrics.....I was even able to put all my Kaffe fabrics in one of the baskets.